The deadly protests that have rocked Ethiopia over the past several months, resulting in the declaration of a six-month state of emergency, stem from many regional and national grievances, most of which reflect a sense of economic and political marginalisation by wide sections of the country. 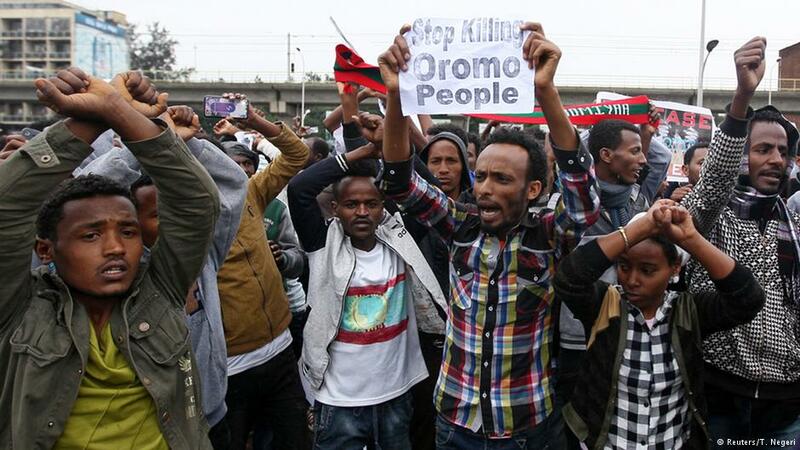 The unrest in the south dates back to November 2015, when demonstrators opposed a government plan to expand the boundaries of Addis Ababa into the Oromo regional state. Farmers were particularly upset, worrying that they would lose their farms in the government’s notorious “land grab” policy. Those protests have claimed the lives of hundreds of people and still counting. In July, another wave of protests began in the Amhara region when the government arrested members of the Welkait Committee, who were demanding the reversal of a 1991 decision by the ruling party to annex three districts of the Amhara region into the Tigray regional state. The inhabitants of these districts identify as ethnic Amhara and want to be reintegrated into the Amhara regional state, of which they have been a part for centuries. The larger context for these protests, however, is the fact that for the last quarter century Ethiopians of various ethnicities have been subject to a system of governance whereby the Tigray People’s Liberation Front (TPLF), which represents a mere 6% of Ethiopia’s population, controls virtually all key levers of economic and political power. The TPLF, its cronies, party loyalists and their families control more than 70% of the modern economy, including communications, transport, agriculture and the defence industry. Key political institutions, including defence, intelligence and foreign affairs, are similarly owned and operated by and for the benefit of the ruling ethnic clique, with as many as 98% of the top echelons of the military and security forces being staffed by ethnic Tigrayans. In a word, the TPLF owns the government. Although the federal constitution was designed to empower the major ethnic groups of the country to form their own states as the main framework for their governance, none of the member states (with the sole exception of Tigray) have any real powers to take care of its internal affairs. As a consequence, the Oromo and Amhara ethnic groups – who together constitute close to 70% of the population – are deeply resentful about playing second fiddle. Naturally, this has been a deep source of political disaffection for vast numbers of the members of these communities. At the same time, the ethnically based federal system has left minorities trapped in their respective regions. They are treated as second-class citizens, lacking access to education, civil service employment, business licenses, bank loans and land leases on a nondiscriminatory basis. Even worse, they are liable to be expelled from regions in which they are considered “outsiders”. This has particularly been the fate of the Amhara, who have faced mass killing at various times since the current government came to power. Yet the central authorities have shown no willingness to take protective measures or to provide any legal redress for these minorities. Compounding the problems thrown up by ethnic division is endemic corruption. Ethiopia ranks 103 out of 168 countries on Transparency International’s corruption perceptions index, a global civil society coalition that encourages accountability. It has also lost about $25bn since 2000 to illicit financial outflows, according to Global Financial Integrity. Government officials and party loyalists receive preferential access to credit, land leases and jobs. Areas vulnerable to corruption are land administration, tax and revenue, the justice system, telecommunications, land procurement, licensing areas, and the finance sector. Particularly egregious is the government’s practice of leasing large tracts of land to foreign governments and local investors in opaque deals that have displaced thousands of people. Also disconcerting is the fact that 50% of the modern economy is controlled by conglomerates affiliated with the ruling party. A further factor fuelling the protests in Ethiopia is youth unemployment and the sense of hopelessness it has engendered. In recent years, the country has been producing thousands of college and university graduates each year but only a limited number are able to obtain productive employment. A sizable number often risk their lives to brave the Sahara desert and Mediterranean Sea in a desperate search for better opportunities. Others remain unemployed for long periods or are engaged in cutting cobblestones for streets. Freedom of assembly and association are guaranteed by the constitution but they remain a dead letter in practice. The government often resorts to its anti-terrorism law to stifle political dissent and to terrorise its political opponents. The judiciary is officially independent but in practice it rarely deviates from government policy. As of 2014, Ethiopia holds the second highest number of journalists behind bars. The TPLF-government has to be held to account. The donor communities, particularly the UK, the US and the EU, should stand with the Ethiopian people by ceasing all military, financial and diplomatic support to the tyrannical government, supporting instead the opposition’s call for an all-inclusive transitional process to replace the current government.